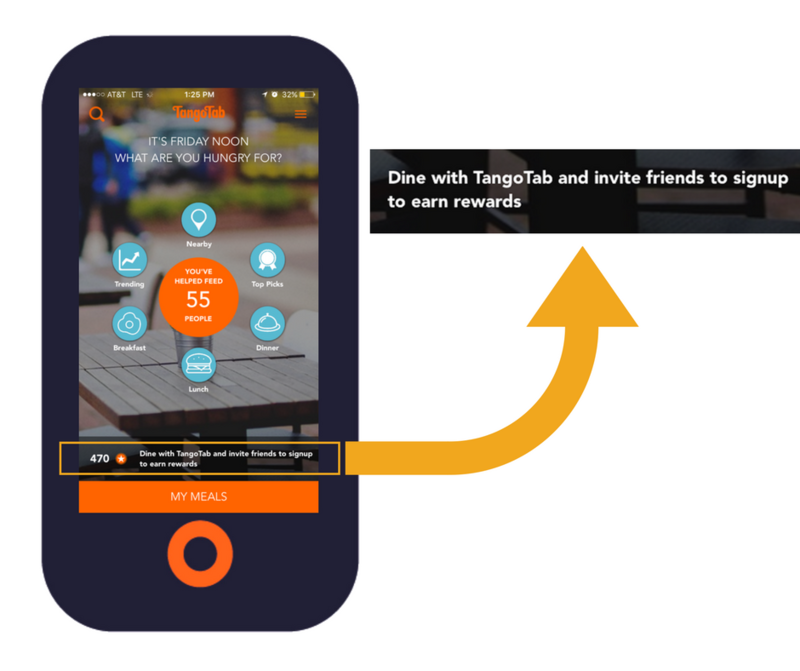 Did you know that you can earn points on the TangoTab app? 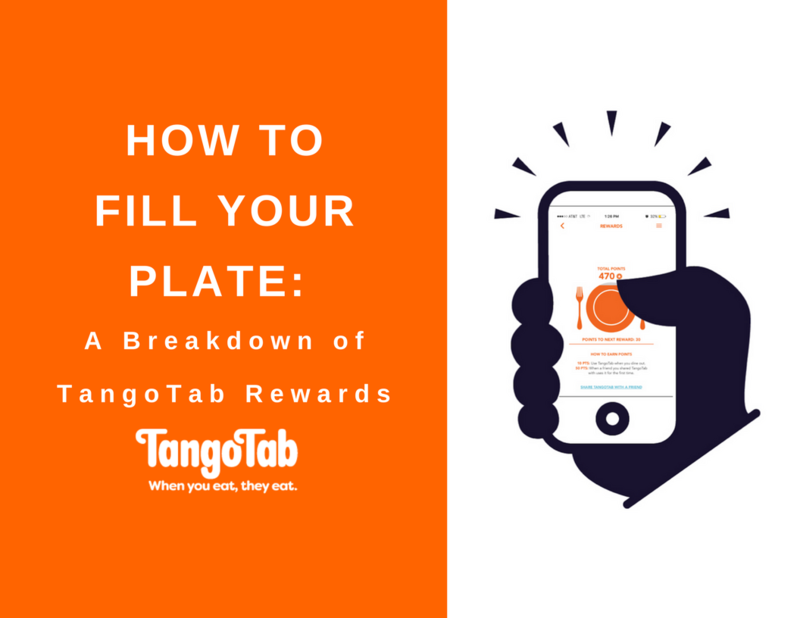 This post offers a visual breakdown of the TangoTab rewards system! First, we have an overview of the rewards system. Second, we show you how to access the rewards features on your app so that you can follow along with us on your phone if you want to. 1) Dining out. Every time you check-in at partner restaurants on TangoTab, you earn 10 points. 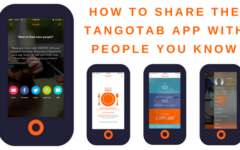 2) Sharing TangoTab with a new user. You earn 50 points every time you share your TangoTab invite code with someone and then they check-in for the first time. If you do not know where to find your invite code, don’t worry! We walk you through the steps in the second half of this post. Every time you earn points, your rewards plate will go from gray to orange until you reach 500 points. Earning points fills your plate! 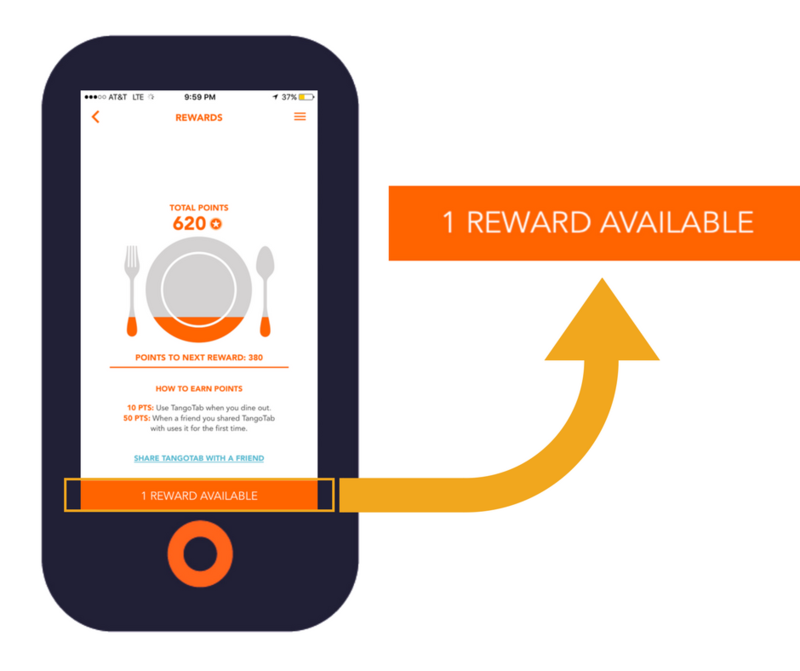 The plate on the REWARDS page goes from gray to orange as you earn points. Your plate will be completely orange once you hit 500 points and earn a reward. The left picture shows a plate about 1/4 full at 120 points, and the second plate shows a plate almost all the way full at 470 points. When you consume your reward, you have the choice between feeding 50 people in need or receiving a gift card (pictured below on the left). You are free to choose whichever you want; however, most people choose to feed 50 people with their points. When you choose to feed 50 people in need, we tell you how awesome you are for caring about others (pictured below on the right). We really do love you guys, and we’re inspired by your efforts to help end hunger! The left screen shows the selection box you’ll see when you have earned 500 points and are eligible to “consume” your reward. The right shows the message we send you to tell you how much we love you for caring about others when you choose to feed 50 people with your points. 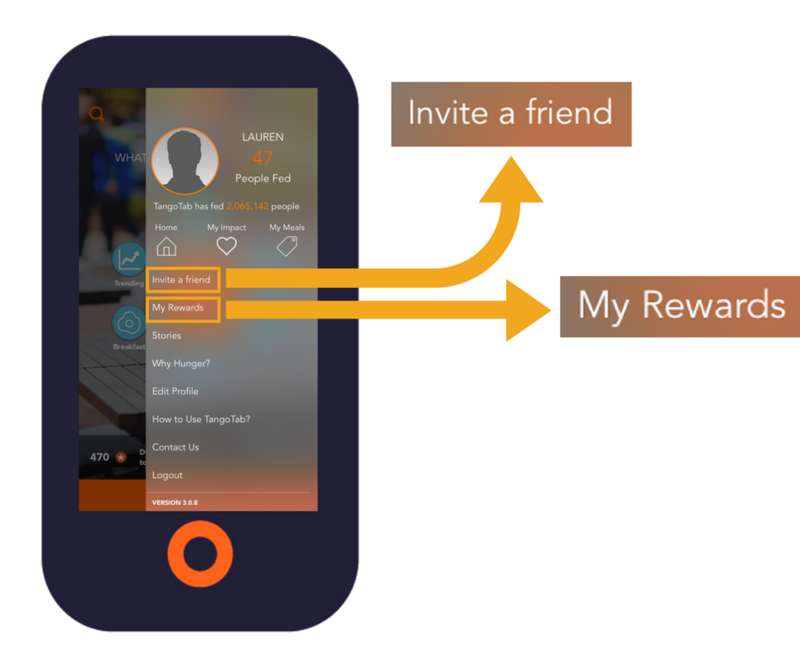 Once you open your REWARDS page on the app (we are about to show you how to do this), you will know if you have rewards available based on whether or not you see an orange bar at the very bottom of the page. If you see an orange bar, then you have a reward available. Press the bar to redeem your reward! In the example screen below, the TangoTab account pictured has 1 reward available. On the REWARDS page, you will know if you have rewards available based on what the orange bar at the very bottom of the page says. If you do not see an orange bar, it’s because you don’t have any rewards available yet. You will soon though, we know it! 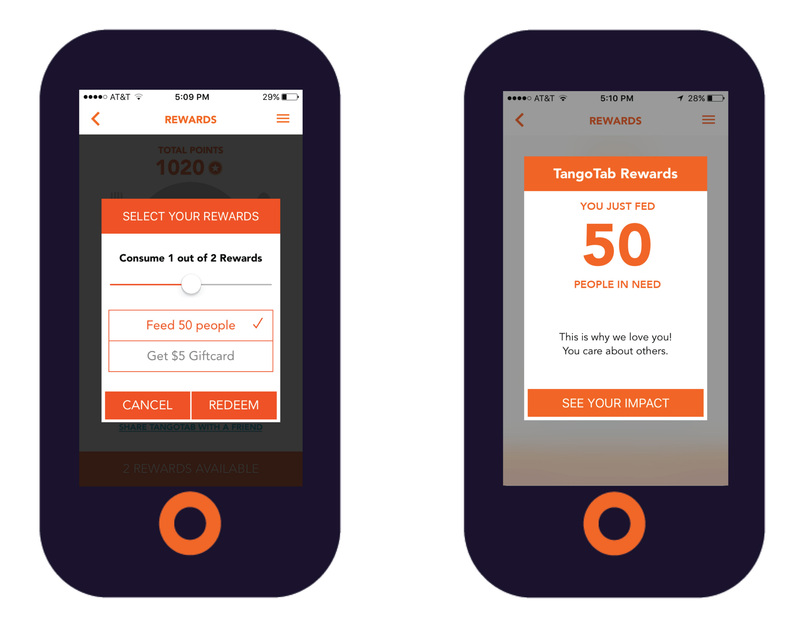 Keep reading to learn how to access the REWARDS page on your TangoTab app. Now we are going to show you how to access the rewards features on your app. 1) Open your TangoTab app. 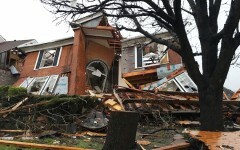 2) Below is a photo of the app’s homepage. You should be looking at something similar to the screen below if you are following along on your phone. 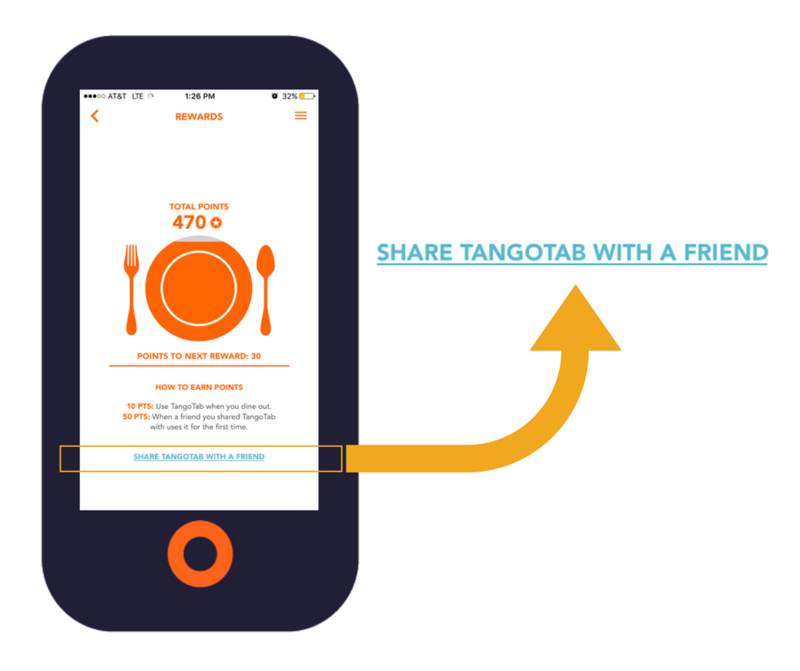 Tap the button on the bottom of the page that says, “Dine with TangoTab and invite friends to signup to earn rewards.” This button is directly above the orange button at the very bottom of the page. To access your rewards plate, tap “Dine with TangoTab and invite friends to signup to earn rewards.” This button is on your homepage. 3) Now you should see your rewards plate! Remember, if you have a reward available, you will see a message indicating this on an orange bar at the bottom of the page. On the REWARDS page, you can tell people you know about the TangoTab app by hitting the button that says, “SHARE TANGOTAB WITH A FRIEND.” This button is blue and underlined near the bottom of the page. You can tell people you know about TangoTab by hitting the button that says, “SHARE TANGOTAB WITH A FRIEND.” This button is near the bottom of the REWARDS page. 4) For those following along on their apps, you should now be on the SHARE page. 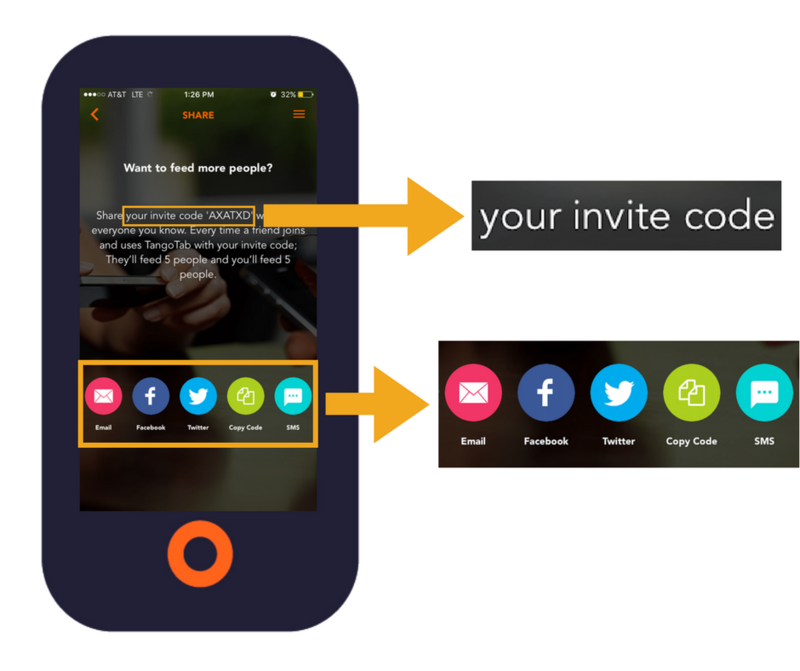 On the SHARE page, you can view your invite code and easily send it to people you know via email, Facebook, Twitter, or text message. You can also copy your code and paste it elsewhere. Your invite code is in the first sentence of the blurb at the top of the page, on the line directly beneath “Want to feed more people?” A “Copy Code” button and links to send your invite code to people you know are grouped at the bottom of the page. Tap the icon you want to use, choose your recipient, and the app will take care of the rest! This page allows you to easily share your invite code with others. Every time you share TangoTab with someone using your code and then they use the app for the first time, you earn 50 points. You can also access your rewards plate and invite code by clicking on the menu icon in the top right corner of your app. The screen pictured below points out the menu icon on the app’s homepage. Your menu icon will always be in the top right corner of any page you’re on within the app, so if you are on another page, you do not have to return to the homepage to access the menu. The menu icon looks like a stack of three orange bars (pictured). Tap the icon to open the menu. You can also access your rewards plate and invite code through the menu icon. The menu icon looks like three stacked orange bars, and is visible in the top right corner of every page. When the menu opens, you will see “Invite a friend” and “My Rewards” written at the very top of the list below your profile. The “Invite a friend” button will take you back to your share page and the “My Rewards” button will take you back to your rewards plate. You can also access your invite code and your rewards plate by pressing the menu icon and choosing the option you’re looking for. 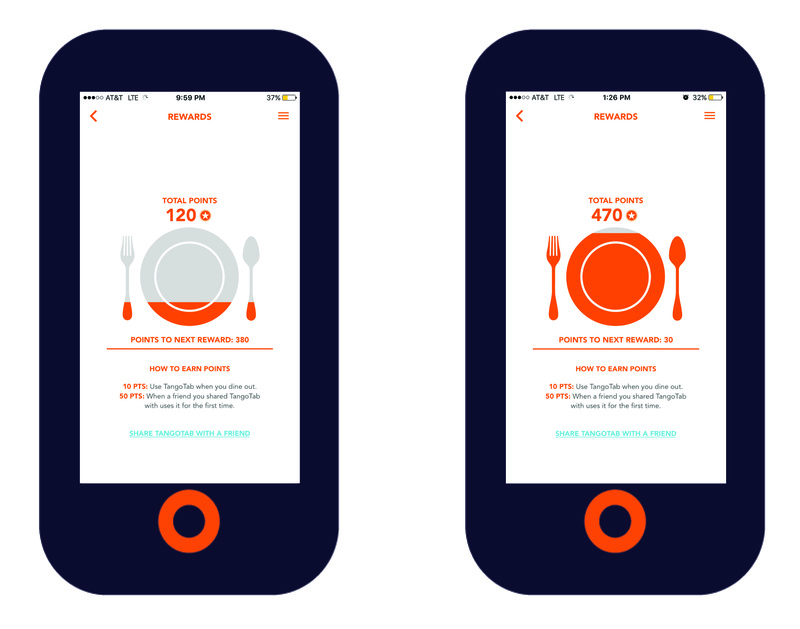 It’s really fun to see your plate fill up on the app, and even better when you realize that every time the plate becomes more orange, it’s a sign of more and more people in need having food. Overtime, meals donated because of the cumulative efforts of the TangoTab community really add up! Thank you for doing your part to help fight hunger. Did you find this breakdown helpful? Please let us know your thoughts in the comment section. What Are Millions Of Children Not Saying Everyday?